Towne Ford has taken delivery of the all new 2016 Ford Fusion in the San Francisco Bay area. We have a wide selection of these elegant and fuel efficient four door sedans in stock. Offered in a variety of models such as the Fusion S, SE, Titanium, S Hybrid, SE Hybrid, Titanium Hybrid, SE Energy and Titanium Energi this versatile vehicle will fit just about any driver’s preference. If you are looking for a car that will help you save money at the pump the Fusion is a perfect choice. The standard 2.5L i-VCT I-4 engine delivers an EPA estimated 22/34 City/Hwy MPG and the available Hybrid engines offer a remarkable estimated 44/41 City/Hwy. The Fusion’s sculpted lines and sleek body design are complimented by a well appointed interior with comfortable seating for five adults. Specialty features such as available ambient interior lighting, climate control and navigation with SiriusXM Traffic/Travel link, set the Fusion far apart from the average sedan. 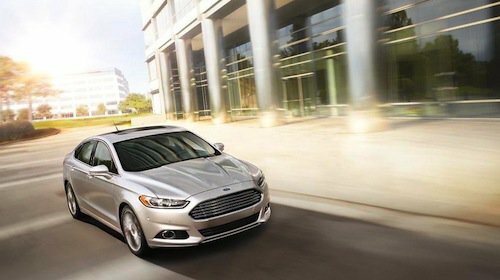 With a starting MSRP of $22,110 the Fusion is one of our most popular Bay Area Ford models. We invite you to stop by our showroom and test drive a new 2016 Ford Fusion near San Francisco, CA soon.